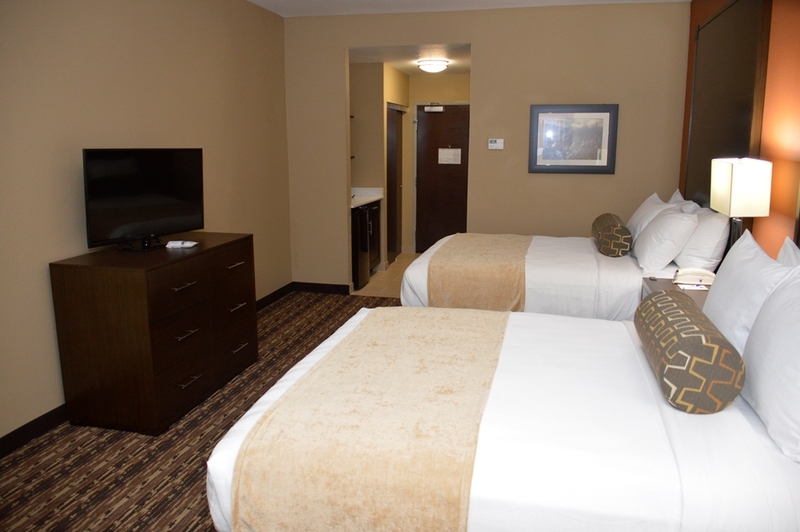 The Best Western Plus Elmendorf Hotel is conveniently located on Interstate 37 South and Anderson Loop 1604. Only minutes away from downtown San Antonio, which is home to the Alamo and the San Antonio Spurs. We are also proud to be the closest hotel to the expansive Mission City Soccer Complex at just 2.8 miles! Whether youre here to play in a soccer tournament, or just enjoy watching this exciting sport, youll love everything that our comfortable hotel has to offer. Whether your stay will be for business or pleasure, come experience all the comforts of home. Our friendly staff will check you into your room where you will find a comfortable bed with a pillow top mattress and luxurious linens. Relax while watching television on our 40-inch LED flat-panel HD televisions and with a variety of programming including over 30+ channels. Stay in touch with friends, family or business with our free wired and wireless high-speed Internet access. After a long day, unwind in our fitness center or take a leisurely dip in our outdoor pool. After a relaxing evening, wake up and start your day off right with our free full hot breakfast, featuring eggs, bacon, make your own waffles, oatmeal, pastries, breads with assorted juices and coffees. Our Elmendorf Hotel is near all major oil and gas companies as well as some of the most graceful people around. Fishing at Braunig Lake is definitely a must do for some pleasure. The Best Western Plus Elmendorf Hotel prides itself on its warm southern hospitality, and we invite you to come and experience this yourself. Pool - Outdoor pool, 10 a.m. to 10 p.m.
From: Interstate 37 North. Take Interstate 37 South to Exit 125 (Anderson Loop 1604), keep left, make right at signal light, turn right at Eagle Ford Cmn and left at Eagle Ford Way to the Best Western Plus Elmendorf Hotel. From: Interstate 37 South. Take Interstate 37 North to Exit 125 (Anderson Loop 1604), make left at signal light, turn right at Eagle Ford Cmn and left at Eagle Ford Way to the Best Western Plus Elmendorf Hotel. From: Loop 1604 West. Head east on Anderson Loop 1604 and turn left at Eagle Ford Cmn and left at Eagle Ford Way to the Best Western Plus Elmendorf Hotel. From: Loop 1604 East. Head west on Anderson Loop 1604, go under Interstate 37 and turn right at Eagle Ford Cmn and left at Eagle Ford Way to the Best Western Plus Elmendorf Hotel.